go to main page and download flash plug-in! Our NEW domain name and address! Update: Fiona is not on Crystal Method's Tweekend. Some speculation arose with Sonicnet's news of February 20 reporting Crystal Method's summer-due album, Tweekend, with a handful of artist-guests including Fiona's producer Jon Brion. Fiona techno? 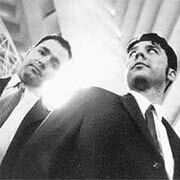 The latest news (March 2, 2001) from Rolling Stone.com, headlines Apple Helps Crystal Method as one of the artists backing up Tweekend, along with Stone Temple Pilot's Scott Weiland, Rage Against The Machine's Tom Morello, Beck's turntabilist DJ Swamp, and producer Jon Brion. The Crystal Method duo has been working in their California studio (known as the bombshelter) for a year-and-a-half on their sophomore album. On Tweekend: "It's a little less electronic or techno but it still sounds like us." Jon Brion is listed as singing and playing keyboards on a track called "Over the Line." No track specifics have been given about Fiona so far. As soon as more information and confirmations are given, we'll make sure to keep you updated. 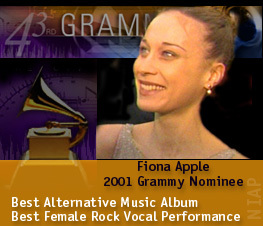 Fiona got shut out by seasoned Grammy veterans Sheryl Crow (Best Female Rock Vocal Performance) and Radiohead (Best Alternative Music Album) at the 43rd Grammy Awards. 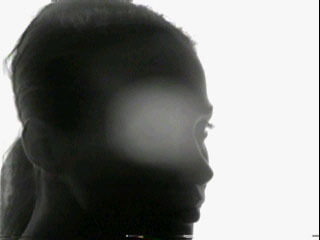 A no-win does not diminish the brilliance of When The Pawn.... It'll continue to shine for Fiona and for all fans. Fiona was spotted on the red carpet by David Adelson of E! Television. 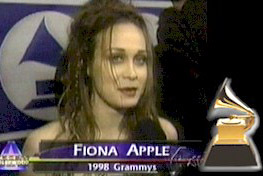 He asked her about her low key approach to this album and Fiona responded quick-wittedly. We captured some of the video and hope to have it up soon. Fiona looked beautiful and was all smiles even though she didn't walk home with the trophies. The 43 Annual GRAMMY Award Nominations were announced this morning for recordings released during the Eligibility Year October 1, 1999 through September 30, 2000. It's the industry's most prestigious award "awarded by and to artists and technical professionals for artistic or technical achievement, not sales or chart positions. Truly a peer honor." The 43rd annual GRAMMY Awards show will take place on February 21, 2001, at the Staples Center in Los Angeles. The GRAMMY Awards are telecast annually to an international audience of over 1.5 billion in 170 countries. We're hoping to hear some Grammy nominations in the beginning of January. Keep your eyes and ears open. The 2000 Billboard Awards were presented Friday, November 11, at the Universal Hilton Hotel in Universal City, California. This was the grand finale of Billboard's Music Video Conference (Nov 8-10). As you know, Fiona's "Fast As You Can" [clip] video directed by PTA was nominated for Best Clip of the Year in the Pop category. Unfortunately, it did not win. The award was given to Madonna's "Music" by director Jonas Akerlund. For the first time, voting for the video awards was open to Billboard readers (subscribers). Previously, it was only open to people registered for the Billboard Music Video Conference. Looking for a good interview to read? 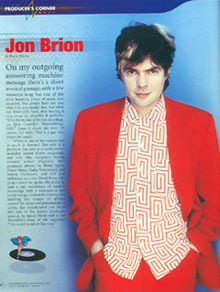 We've added the Jul/Aug 2000 of Performing Songwriter's in-depth interview with Jon Brion, now one of the hottest producers, on his works including the production of When The Pawn... . You'll find detailed and candid comments from his first-listen of these 10 amazing songs to the everyday production of bringing about the intimate, emotional perspective of Fiona's songwriting. The creative "colors" and nuances of Jon Brion's production only heightened Fiona's conception of each song. The result -- a brilliant, timeless, and intimate album Fiona is so proud of. When The Pawn... is eligible for the next Grammys. The Grammy Award process of screenings and reviews for entries will be completed in the next few weeks. On January 13 (or so) the final Grammy ballots will be sent out to the 11,000+ voting members and will be due back on February 5 for final tabulation. Our focus and hope is that Fiona and When The Pawn... will meet some nominations and awards here. This will certainly boost this fan-loved and critically acclaimed album. 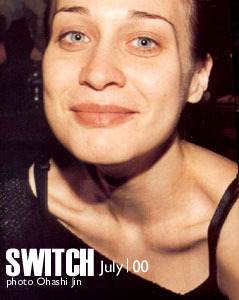 Well, we picked this issue over the weekend and if we expected to see more Fiona, or anybody else from that cover with additional inside pictures, you'll be disappointed. They are not individually featured. However, you'll find some great pictures of other artists, including a beautiful pregnant Tori, "the free[from-record-companies]wheelers" Aimee Mann & Michael Penn, P. J. Harvey, amazing pictures of B.B.King, Lou Reed, Marc Anthony and Celia Cruz, The Roots, and more by the renowned and favorite Annie Leibovitz. 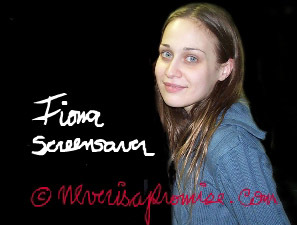 Click here for a larger version of the cover & Fiona. Also check out our Articles/Interviews/Reviews section for the accompanying Vanity Fair cover blurb. Pick up your November 2000 issue -- on sale October 11 -- of the latest Vanity Fair - The Music Issue! on the cover with Fiona, Bjork, Bono, Macy Gray, Keith Richards, Chuck Berry, Patti Smith, Dr Dre, Faith Hill, Carlos Santana, Faith Hill, Zac De La Rocha. "Together they've won truckloads of Grammys, gold records, and Rock and Roll Hall of Fame inductions. Here are 59 pages of portraits in Vanity Fair's first-ever Music Issue, from Aretha to Yo-Yo, from Sonny Rollins to Iggy Pop�a pantheon of rock gods, R&B geniuses, jazz giants, and classical icons. Photographs by Annie Leibovitz, David Bailey, Julian Broad, William Claxton, Michel Comte, Todd Eberle, Timothy Greenfield-Sanders, Sam Jones, David LaChapelle, Mary Ellen Mark, Michael O'Neill, Herb Ritts, Bruce Weber, and others." Also we hear that E! had a "making of the shoot" for this issue with Dr Dre's "heavenly" exclamations sitting between Fiona and Faith Hill. See if you can catch it on E! We'll be sure to add more details if they become available. The Billboard Awards will be presented November 10 at the Universal Hilton in Universal City, CA. Fiona's "Fast As You Can" video [clip] has received a nomination under the POP category for "Best Clip of the Year." The video directed by Paul Thomas Anderson was the first video to accompany the first single from When The Pawn... Other nominees for this category are: Bloodhound Gang ("The Bad Touch"), Foo Fighters ("Learn To Fly"), Madonna ("Music"), and Robbie Williams ("Rock DJ"). "Fast As You Can" was truly a captivating video filmed in L.A. using a vintage classic, hand-cranked Lumi�re (cinema pioneers) camera. Giving homage to their early artistry, the L.A. train arrives embarking us all for the ride of a song. The beautiful black & white closeup images with desynchronized sound, blend with color giving a classic/modern look to the video. The changes in pace with the song are cleverly captured finally leaving a lit match flame-eating Fiona with a full smile. A well-deserved nomination. Now we're all looking for an award. September 09, 2000: Updates . . .
Time flies! We had to take time off due to health issues. With that in mind, first we'd like to say that Nanikita's surgery went well and she's on the road to recovery. We thank all you well-wishers for all your kind words conveyed through email and cards. It was very uplifting during a difficult time. Thank you. It's been fairly quiet on Fiona's front. We know she's fine and enjoying her time off. On a calendar note, she'll be turning 23 this Wednesday. Many Happy Birthday wishes to our dear friend Fi! We've also added some pictures from the Japanese magazine Switch from July. They are beautiful pictures taken during her recent tour in Japan. As for the belated contest for the DVD of 6 music videos by Paul Thomas Anderson, we'll be providing all the details very soon!